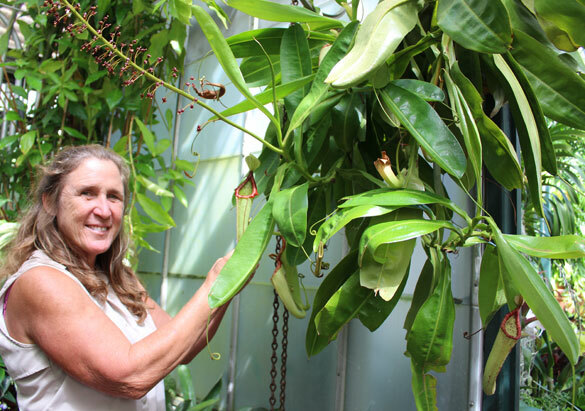 When Kathryn Marsh and Todd Roy say there are plenty of reasons to visit Biltmore's Conservatory in late summer, they're not exaggerating. Once you enter the historic structure located at the end of the Walled Garden, it's like stepping into another world—one filled with lush tropical treasures and venerable vines plus dazzling array of colors, scents, and textures to delight your senses! 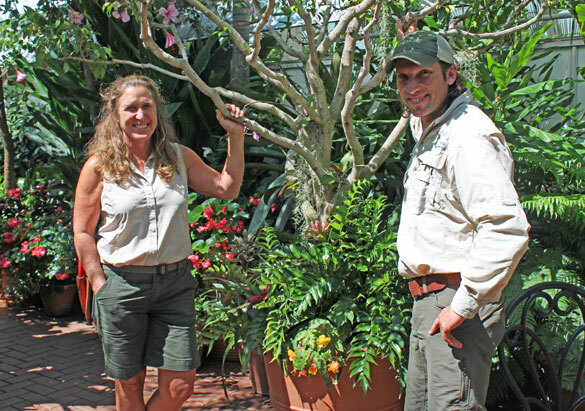 Kathryn and Todd are the members of Biltmore's horticulture team who care for the thousands of exotic and interesting plants that fill the Conservatory. While that much responsibility might seem daunting, the two enjoy meeting the needs of their botanical "co-workers," from hand-watering them every morning to knowing their preferences for light and shade. "George Vanderbilt chose plants with the same attention and interest as the art he collected," said Kathryn. "Some of the specimens he selected are beautiful, some are rare, and some are just odd and interesting." The Conservatory has an impressive collection of Cycads with a few dating back more than a century to the time of the Vanderbilts. Cycads only grow about one inch per year, so the size some of these have achieved is especially impressive. 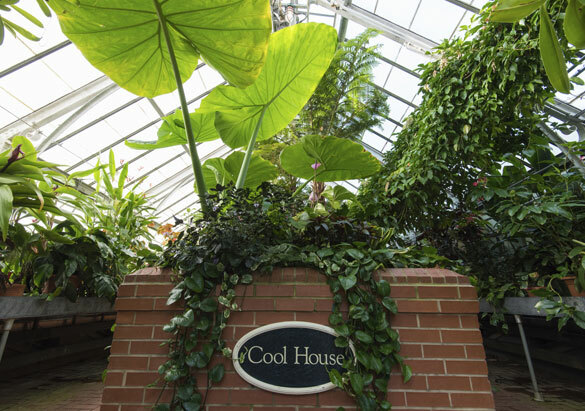 Just inside the Cool House, look for a grouping of Thai Giant Elephant Ears (Colocasia gigantea) featuring some of the largest leaves in the Conservatory. 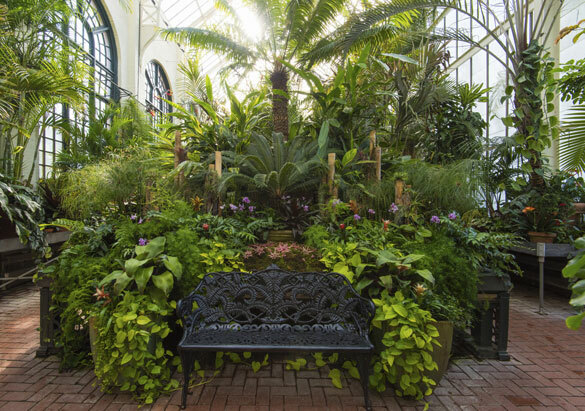 Each year, Kathryn and Todd create special themes for the two alleys located between the main wings of the Conservatory. This year, they're showcasing useful/edible plants in one alley and water features in the other. 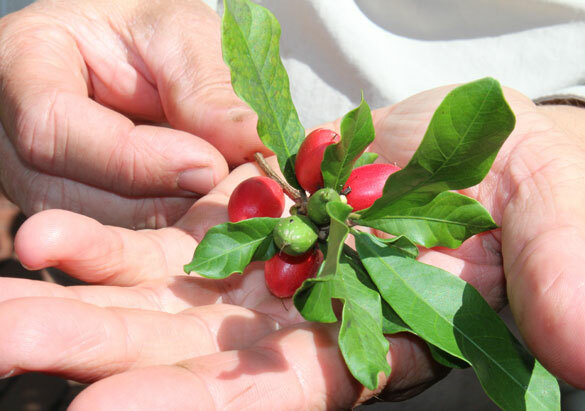 Have you ever wondered how coffee, cotton, or allspice (Pimenta dioicaa) grows? You'll find examples of each along with black pepper vine, Miracle Fruit (Synsepalum dulcificum) that makes sour foods taste sweet, Barbados cherry (Malpighia emarginata), an important source of Vitamin C, and many more. 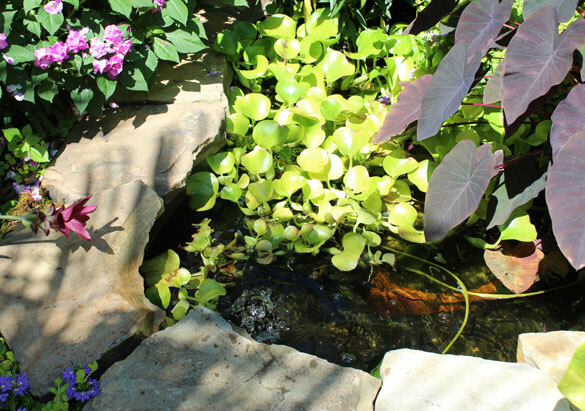 Once you've admired all the edible plants, take a stroll down the opposite alley to experience the soothing sounds of water trickling and splashing over pebbles into small pools surrounded by lush container plantings. Linger here to watch the play of light on water and absorb the peaceful atmosphere of this relaxing space tucked away and just waiting to be discovered! 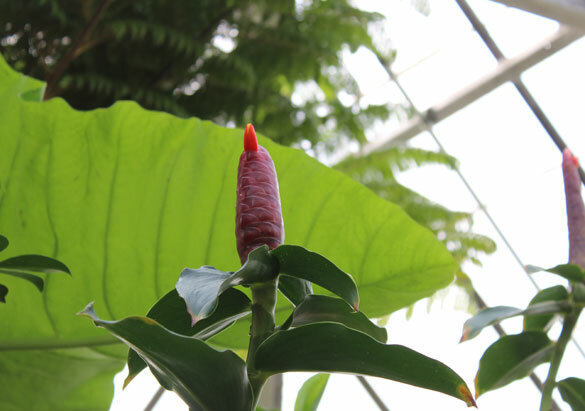 According to Kathryn, the Red Button Ginger (Costus woodsonii) growing near the end of the Cool House is a hummingbird magnet. "When it flowers in late summer, each ginger cone produces a single red bloom," said Kathryn, "and the hummingbirds know it's there, almost as if they've mapped out the Conservatory. I see them early in the morning, visiting each flower, then flying away before it gets too warm inside." Want to visit the tropics without leaving Biltmore? Don't miss the fragrant display of Plumeria in containers along the back wall behind the Conservatory. 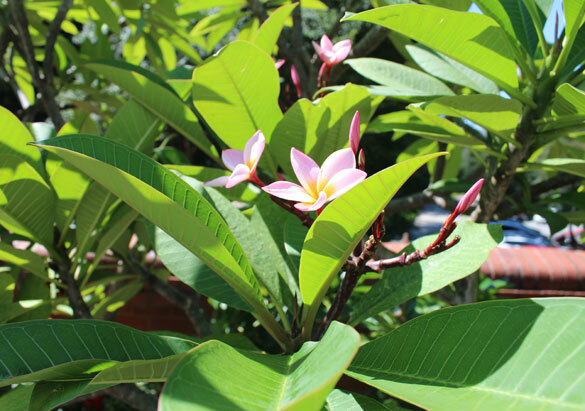 Also commonly known as Frangipani, Plumeria is native to many of the world's tropical regions and the beautiful blooms are often used in Hawaiian leis. If you're a fan of Coco Chanel's iconic Chanel No. 5 perfume, your nose may lead you to a very special specimen growing in Biltmore's Conservatory. 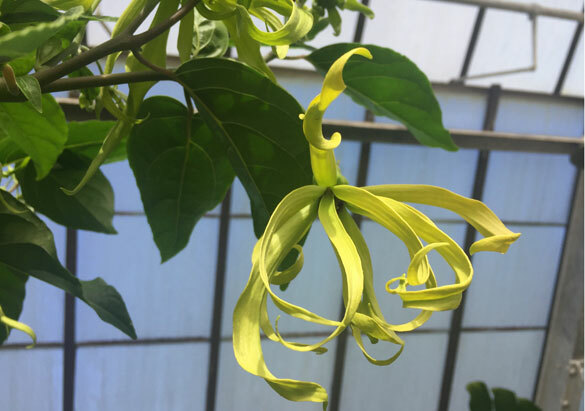 The Ylang Ylang Tree (Cananga odorata) produces creamy yellow flowers with long petals, and their heady floral scent is the signature note associated with the world-famous fragrance. The area of the Conservatory dedicated to members of the cactus clan definitely keeps some secrets from our day guests! 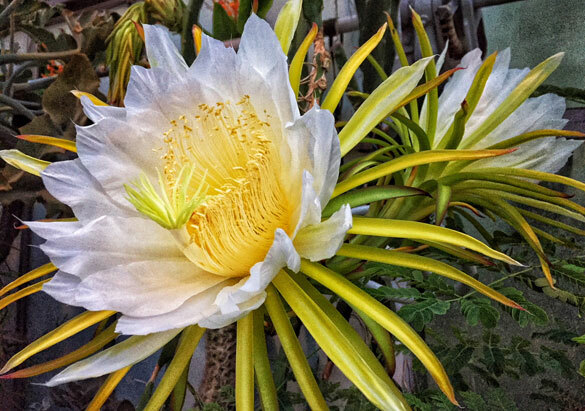 "It's actually very hard to catch a night-blooming cactus at its peak," Todd tells us. "You have to be here late at night or very early in the morning to see the full potential of the flowers." Lucky for us, Todd has captured some elusive blooms from the Cereus family like this stunning Queen of the Night (Epiphyllum oxypetalum) example. While the idea of carniverous plants may seem like an oxymoron, Slender Pitcher Plants (Nepenthes gracilis) and other varieties offer a fascinating glimpse into a highly-specialized world in which plants attract and trap insects as their main source of food. The year-round warmth of the Conservatory provides a perfect environment for both the pitchers and the insects on which they feed. 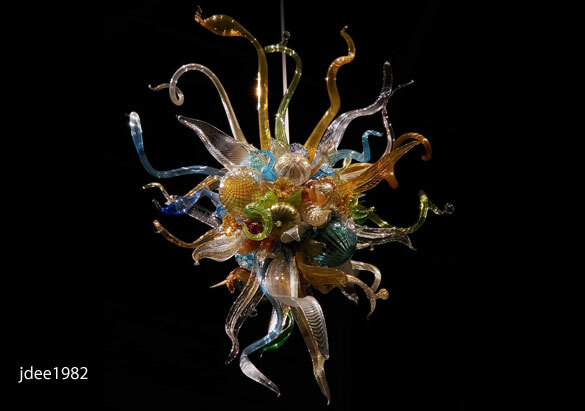 No visit to the Conservatory is complete without marveling at the glorious glass sculptures by artist Dale Chihuly during Chihuly at Biltmore and Chihuly Nights at Biltmore. As you approach the Conservatory, note the Cattails and Copper Birch Reeds installed in the Butterfly Garden. Inside the structure, look up to the ceiling to spot three intricate Burnished Amber, Citron, and Teal Chandeliers; you'll find them at the far left, far right, and in the center of the main room. 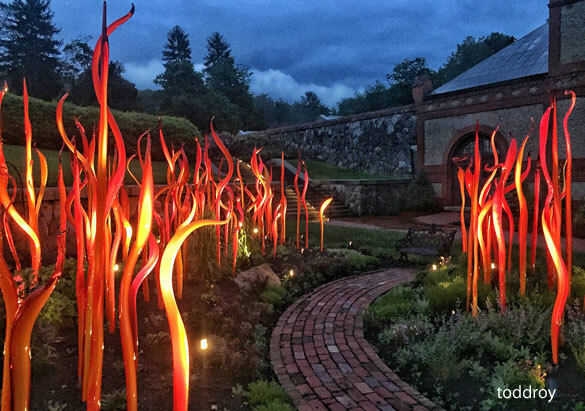 Their time is limited, however, as these breathtaking "blooms" are only here until October 7.